Rusty Firmin was adopted as a baby and brought up in Carlisle as the son of an Army NCO and his wife. He had a turbulent childhood and his adoptive mother died when he was 11, after which he was passed round his parents’ occasionally abusive families until he joined the Army as a ‘Junior Leader’ aged 15. As an adult soldier he served for ten years in the Royal Artillery before volunteering for the SAS and passing selection on his first attempt. As a junior and relatively inexperienced SAS NCO he was surprised to be given command of one of the two assault teams at the Iranian Embassy Siege in 1980 and was personally responsible for killing Feisal, the second in command of the terrorist cell, during the dramatic final assault. After 15 years service in the SAS, during which he served all round the world, he left the Army to join the ‘circuit’ of private security contractors. 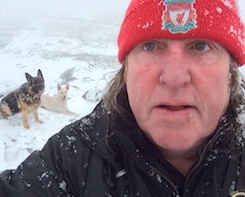 He has recently been signed to endorse a range of survival products and has also been contracted as technical advisor for a feature film about the SAS. He is the co-author, with Will Pearson, of ‘Go! Go! Go! The Story of the Iranian Embassy Siege’. A fitness fanatic and keen sportsman throughout his life, as a member of the Army football team in the early 1970s he was asked to consider joining Arsenal as a professional footballer. He now lives with his wife in an idyllic village on Dartmoor. 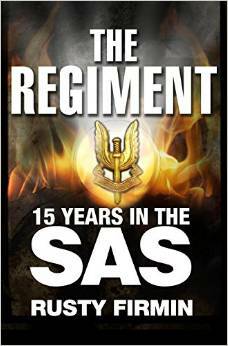 The Regiment: 15 Years in the SAS by Rusty Firmin was recently serialised in the Daily Mail. Rusty Firmin has been generating lots of media interest, promoting his new book The Regiment.